You must be thinking that apart from occasional emails, you don’t need to schedule emails to be sent later. Why would you schedule emails to be sent on a particular day and time? It’s because statistics are proof that emails sent on the right days and time do better than the emails sent without taking all that into consideration. Now we know how important it is, So, Let’s get started with Gmail Scheduler. Step 1: Install SalesHandy’s Chrome Plugin From here. Step 2: After successful installation, Refresh your Gmail page. Step 3: Compose an email that you want to schedule for delayed delivery. Step 4: Click on the calendar icon in the compose box. Select preset values like ‘in 1 hr’, ‘in 2 days’, ‘After a week’ or select sending date, time and time zone by adding city/country name or GMT value and Hit “Schedule”. Schedule Unlimited Emails for FREE Now! Tuesday: This is the best day to hit your recipient’s inbox. Especially if you are the one sending email marketing campaigns or Cold Emails to generate more business. Thursday: This is the second best day to send an email. If you are following up on the email you sent on Tuesday, this is the best day to do so. Wednesday: It might not be the most popular one, but it comes second on the best days to send email list. 10 A.M.: Late Morning hours are considered the best ones to send out emails, but many concluded that 10 A.M. is the best time possible time to send out emails. Also, 11 A.M. is also considered a good time. 8 P.M. – Midnight: These timings are unusual but people check their emails and have more time on their hands before going to bed. So, sending out at this time results in better clickthrough rate. 6 A.M.: You already knew that, didn’t you? We all are addicted to our emails, and as soon as we open our eyes, our hands are automatically finding that Grey and Red Gmail icon on our phones to get updated on everything that happened between those 6-7 hours. These were few of the many factors that affect open rates of your email campaign. In order to know more, read best time to send emails. Microsoft users are blessed with their in-built scheduler which lets them send emails at any time in future but Gmail users don’t have that. But worry not. 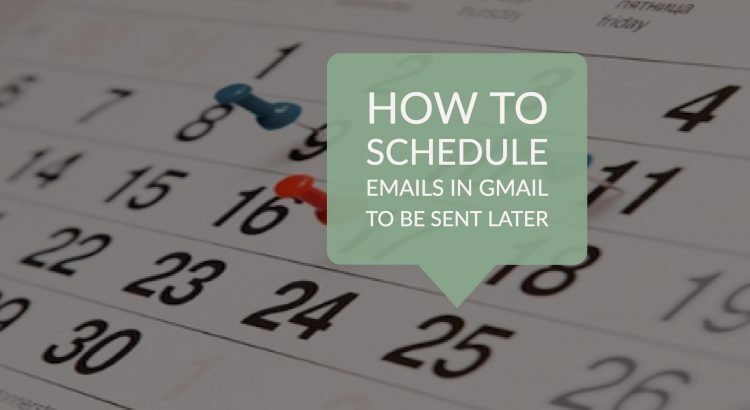 There are ways you can schedule your emails in Gmail to send later. Hit the Recipients Inbox at the Perfect Time! 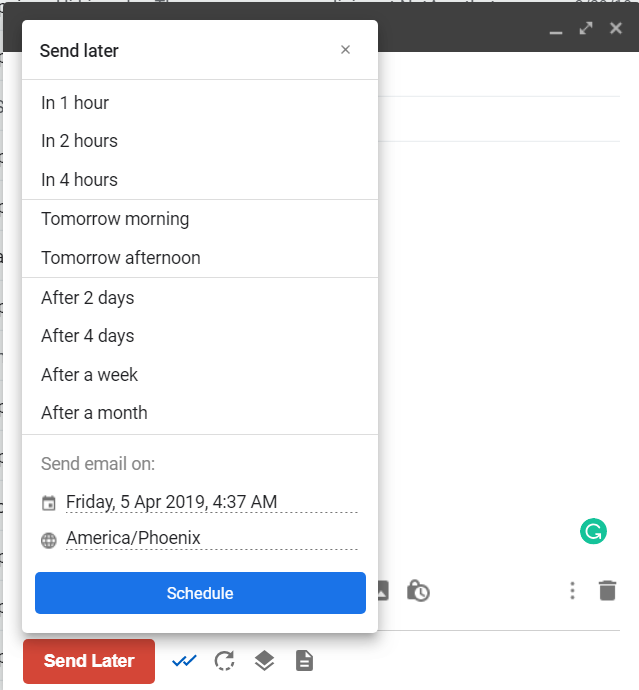 Unlimited Email Scheduling: With SalesHandy, you can schedule as many emails as you want and whenever you want to keep in mind Gmail’s Sending Limit. Time Zone: SalesHandy is Super Flexible. To speed up the email scheduling, it has preset values like ‘in 4 hrs’, ‘tomorrow morning’, ‘after a month’. You can also select your own date, time and preferred time zone by adding city/country name or GMT value of your client/recipient. Dashboard Feeds: Once you schedule your emails you can also manage them. To see and manage all the scheduled emails, Go to Scheduled | SalesHandy label in your Gmail account. Increase Open and Response Rate: This help your emails to stay on top of your recipient’s email box which increases open and response rate. Increase Clickthrough Rate: Sending emails on the right time when the recipient is free or looking for distraction leads to better clickthrough rate. More Flexible: With email scheduler, you can type an email at 3 AM in the morning and still send it at an appropriate time. Type in ideas whenever you get them and schedule to send them at the right time. With such good benefits, Email Scheduling should definitely be the part of our day to day life and you get if for FREE too. Yes, you heard that right! SalesHandy lets you schedule Unlimited Emails every day for 365 and it is FREE of charge too. Schedule Unlimited Emails at Zero Cost! What does Email Scheduler do? It schedules your email to be sent later. Basically it queues your emails in Google’s server to be sent on a particular time. Where does the scheduled emails go? The scheduled emails are saved as draft and will be sent at the time selected for that particular email. Do I need to have internet connection at the time I have scheduled the email? No, you just need to have an internet connection when scheduling the emails and not at the time you have scheduled that email. Will I be able to edit the scheduled emails? Yes, you can find the scheduled emails under the draft folder in your Gmail account and you can edit any email you want. You will not have to schedule the email again after the edit. Once you hit the “Send Later” button after editing and your email will be scheduled automatically. Does my computer have to be left on to use Gmail Delay Send? No, once you schedule as email, it gets queued up in Google’s servers. Do I need to stay logged in the computer or any device? No, you don’t have to. Once schedule, emails go to Google’s server and they work after that. So, even if you logged out, the email will be sent at the appropriate time. Delay send your Gmail emails for free!